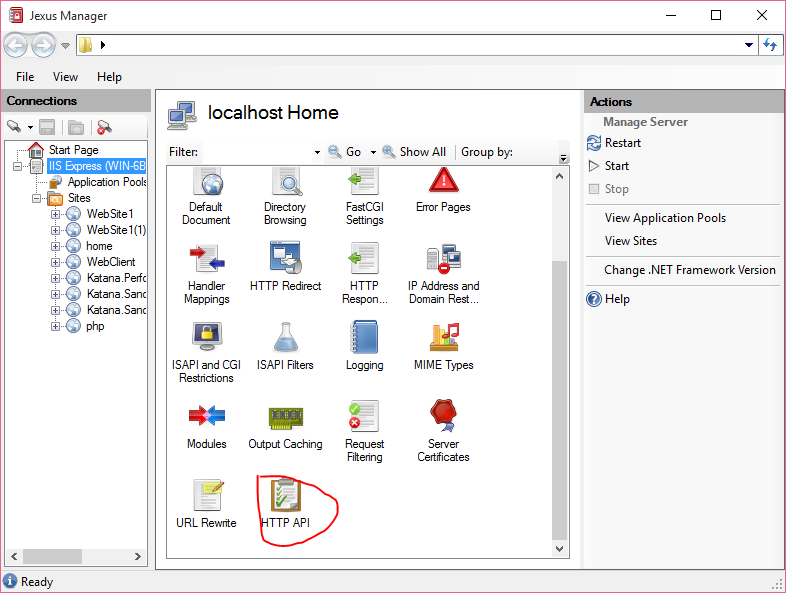 This page shows you how to use Jexus Manager HTTP API page to review IIS/IIS Express HTTPS bindings. You probably wonder how IIS is able to serve HTTPS bindings for web sites, especially when the site bindings map to the same IP:port combination. Where are the certificates? And how does Windows pick up the right certificate? 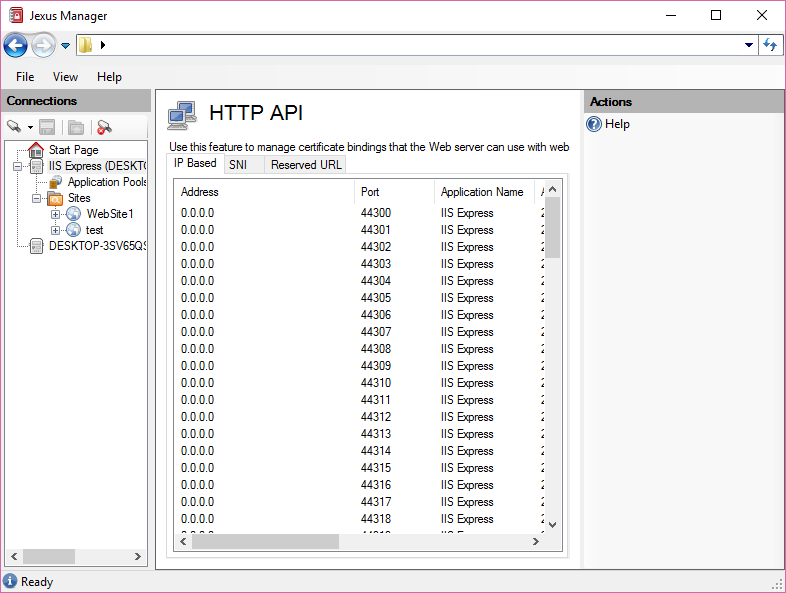 When modern web browsers create an HTTPS connection to a web server like IIS, the initial SSL/TLS handshake packet contains the host name (matching the Host header in future HTTPS requests). This is the so called Server Name Indication (SNI). Check SNI based mappings first. If any mapping matches the host name in the request, return the certificate in that mapping. If there is no SNI mapping matched, check IP based mappings. If the destination IP and port number of the request matches a mapping, return the certificate of that mapping. If no mapping matches at all, this HTTPS connection cannot be created. If a web browser does not support SNI, then only IP based mappings is scanned. Examples: All browsers on Windows XP. If your Windows is too old to support SNI, then only IP based mappings is scanned. Examples: Windows Vista/Windows 7/Windows Server 2008/ Windows Server 2008 R2. Each SNI site bindings should have a corresponding SNI mapping in HTTP API. Otherwise, there is something wrong. The same does not apply to non-SNI site bindings, as they share the same IP based mapping in HTTP API. So in IIS Manager/Jexus Manager if you changed the certificate bind to such a site binding, remember you in fact changed a mapping that affects multiple site bindings (more than the one you changed). So if you notice a wrong certificate is displayed in web browser when you navigate to a page, time to review the mappings. All can be done via equivalent netsh commands if you prefer not to download and use such a visual tool. Ask Google to learn the commands then. If “Require Server Name Indication” is not checked, then this binding is not SNI enabled. It also means for this binding, the certificate is registered to the IP address + port number (in this example, 0.0.0.0:44300). Windows stores the certificate information in a private storage for http.sys to read, which can be queried via netsh http show sslcert. It is very clear that the certificate mappings are here. IIS Express creates mappings for 0.0.0.0:44300 – 0.0.0.0:44399 during its installation, so that non administrators can bind HTTPS sites to such mappings. Due to the limitation of such mappings, we know for a single IP end point, only a single certificate can be registered. That’s why when we attempt to host multiple HTTPS sites on a single IP end point we could only use a wildcard certificate or a UC certificate. Equivalent command line is netsh http show sslcert. 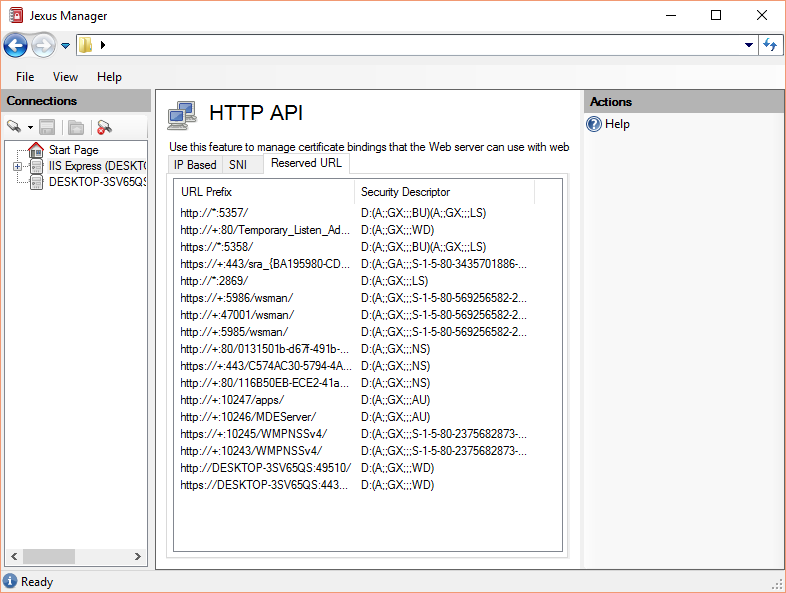 Starting from Windows 8/IIS 8 and above, we can create SNI based in addition to IP based bindings. This allows multiple certificates to be bind to a single IP end point. 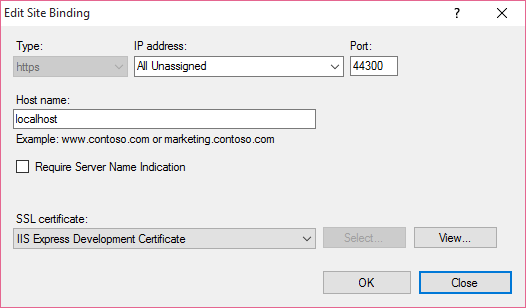 SNI based mapping for certificates is displayed under SNI tab. They are bind to host name + port number instead of IP end point + port number. Such SNI based mappings are automatically created by Jexus Manager when you add SNI based bindings to web sites. They are also removed automatically when such bindings are removed from sites. Reserved URLs are displayed under Reserved URL tab. Microsoft has more information about reserved URLs here . Many applications would register their own URL reservations. Typical applications include Microsoft SQL Server Reporting Services. Reservations can conflict with each other, and that can lead to problems like IIS/IIS Express cannot start to monitor certain site bindings. When troubleshooting conflicts, reserved URLs only provide partial information. 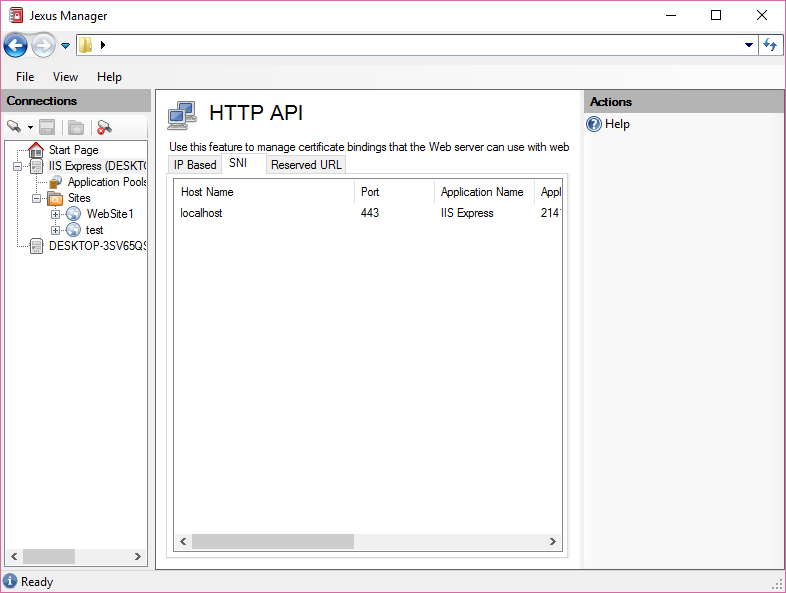 A process running as administrator can hook to Windows HTTP API without any reservation (like a Windows service). Equivalent command line is netsh http show urlacl.